How would you like to decorate a 4-foot wide, 4-foot long white fiberglass bear which will be on display throughout the Boyertown area? Well, Bear Fever wants you to consider being part of a unique community art project. And I do, too, because I personally know you have great creative and artistic talents. You may already be familiar with New York’s and Chicago’s Cow Parades. You may have heard about the Parade Animals—the donkeys and elephants in Washington, D.C.
Bear Fever wants to have 40-60 “funky”bears around the area, sponsored by businesses, civic organizations, schools, or individuals. And we want our community’s bears to be professionally rendered sculptures. That’s where you come in. Why, you ask? Well, it’s not about money. The project is designed to help build a better Boyertown--and have some fun too. The Bear Fever project is about promoting the arts, featuring artistic talent, fostering community pride, spirit and cohesiveness, and allowing our young people to learn from us by having them work side-by-side with artists, business owners, community leaders, volunteers, and civic groups. A small stipend of $300 is offered for time and materials. We know that’s not much. 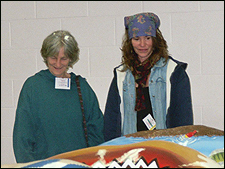 Two bears, currently being decorated by school district personnel and students to serve as prototypes for the project, will be unveiled at Boyertown High School’s Arts Expo, scheduled for May 1, 2004. Please come to the Arts Expo: meet the bears, possible sponsors for bears looking for artists to “do”their bear, the students and staff of Boyertown School District, and other artists. And we hope to secure your participation in our project at that time. The project has been enthusiastically received by the community. Without any active soliciting, the committee has reservations for 20 bears at this time from assorted businesses and organizations. This response suggests that ultimately your participation in the project will benefit the entire community and you as well in marketing your art. The plan is to order the bears in December 2004. 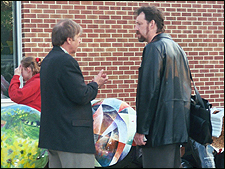 The artists would then have until mid-April to complete their sculptures which would then be displayed at the 2005 BASH Arts Expo. At that time you will be invited along with the students to show off your bear, display your portfolio, and sell other pieces of your work. A good time is planned for all! Please join us! Feel free to call me or e-mail me—Gretchen Lea--at my home numbers 610-367-6773 or glea316@ceinetworks.com. Linda Austerberry and members of Sparks Soccer Team. 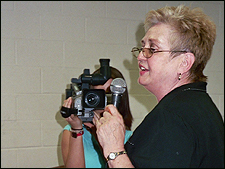 Debra Benfield Burkert and members of the Arts Expo 2005 Committee. Doreen Cechak and students and staff of Washington Elementary School. Pam White and students and staff of Boyertown Elementary School. Harry’s Tattooing and members of the Boyertown community. Joanne Santoliquito and students and staff of Gilbertsville Elementary School. Molly Lorenz and students and staff of Pine Forge Elementary School. Colleen Quigney and students and staff of Colebrookdale Elementary School. Taylor Backes and Tibitu Glass. 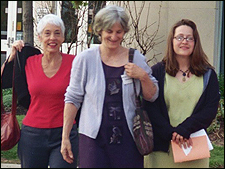 Karen Youse and members of The Center at Spring Street. 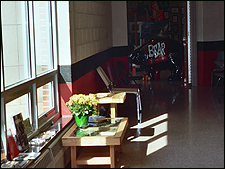 This peaceful, sunny hallway at BASH and the Graber Letterin’ Bear Fever Bear await the start of the 2005 Arts Expo, May 7, 2005. A closer look reveals some of the artists’ work along the window—a pebble-topped coffee table fashioned by Lesta Bertoia, artist for the Custom Construction Bear; several prints; a mini-book called “Home,” illustrated by Barbara Strawser, artist for the Herb Real Estate Bear. All in all, an inviting oasis of beauty at BASH. 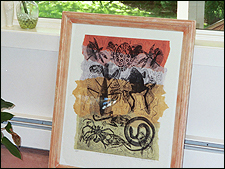 Melissa Strawser’s print found a home with Paul and Jane Stahl. Jane and Paul buy art for their anniversary gifts to one another; Melissa, artist for Zuber Realty Bear, created the perfect piece for their 37th celebration. Christine Burnley, artist for the Leonardo Galetto Bear, shares her passion about art and her enthusiasm for the Bear Fever project with BASH-TV. 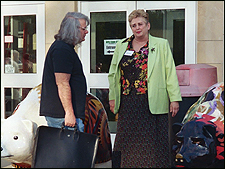 Lesta Bertoia, (center) artist for the Custom Construction Bear, brings her friends to BASH’s 2005 Arts Expo. Alan McBain (lft), artist for the O’Brien-Gere Bear and Christine Burnley, artist for the Leonardo Galetto Bear share thoughts among the bears of Bear Fever. 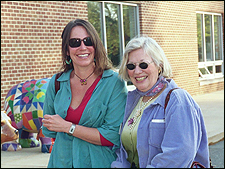 Melissa Strawser (rt), artist for the Zuber Realty Bear and Lesta Bertoia (lft), artist for the Custom Construction Bear, study the techniques and enjoy the diversity in styles of the Bear Fever bears. Melissa (lft) and Barbara (rt) Strawser enjoy a mother/ daughter of celebration at the Bear Fever exhibit of their work. Melissa fashioned the Zuber Realty Bear; Barbara created the Herb Real Estate Bear. Paul Stahl (lft), organizer of Bear Fever, and Mike Hale (rt), artist for Epps Advertising Bear, discuss the challenges of marketing and promoting art in the Boyertown area amidst a bear line up. Art Lives! 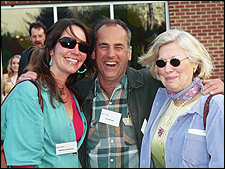 Melissa Strawser (lft), Val Bertoia (center), and Barbara Strawser (rt) celebrate the enthusiastic reception of art at BASH’s 2005 Arts Expo. Melissa fashioned the Zuber Realty Bear; Val completed the TriCounty’s “Hal Bear-toia” Bear and sponsored the Bertoia Bear for Barbara who created the Herb Real Estate Bear.